Liberty Shindel on right presenting the check to Scioto County Economic Development representatives. JD Dowell, representing Flour-BWXT speaking to the crowd about SOAR. Josh Shoemaker, Central Office Administrator speaking for the Scioto County Career and Technical Center (SCCTC). Left to right: Robert Horton Director of Scioto County Economic Development with a map and mission statement for SOAR and Mark Ward, Assistant Director speaking to the crowd. Today, with many local, state and national leaders and representatives in attendance, the Scioto County Economic Development Department and the Scioto County Commissioners officially unveiled Project SOAR, which includes the Southern Ohio Aeronautical Regional Business Park at the Greater Portsmouth Regional Airport. This project promises to bring economic growth and prosperity to our region. These two groups made theannouncement at the Greater Regional Portsmouth Airport in Minford Friday at 10:00 a.m., to all in attendance, who had an interest in this project. 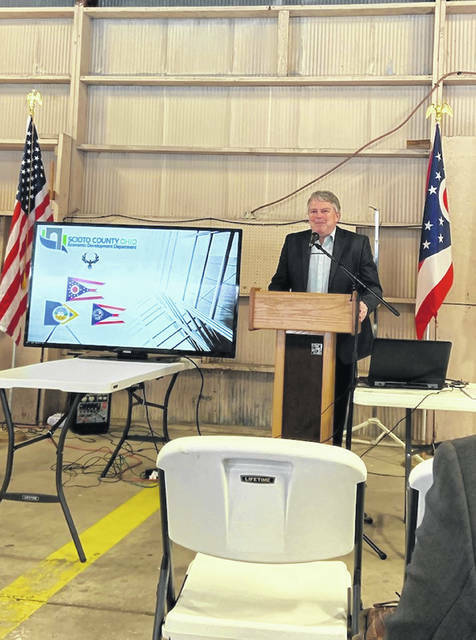 “The Scioto County Economic Development has been in full swing on many many projects, these guys have been working very hard and we owe them a debt of gratitude for all their hard work,” Davis said. “They’ve been working on these projects for many months and the focus and concentration have been to the development of Route #823, with no less than 17 projects ongoing right now, it has been a very busy year. The business park development process here is our vision for better economic development happening now in Scioto County. Davis also told the crowd, “Today you are going to hear about a very important project Project SOAR (Southern Ohio Aeronautical Regional) Business Park, the vision and planning of which started in late 2015. I can honestly tell you that as soon as they announced the building of the highway, plans are starting for this that we are talking about today. It is officially launching today, now, and in the future.” He then asked Doug Green, Republican member of the Ohio House of Representatives for the 66th district to lead the pledge. Liberty Schindel representing AEP, then presented a check in the amount of $10,000 to the Scioto County Economic Development for Southern Ohio Aviation Region. Davis then mentioned Darren LeBrun, Scioto County Engineer, and the work that his office has done in getting this project underway and what they will be doing right away. Finally, Davis introduced Robert Horton Director, and Mark Ward Assistant Director from Scioto County Economic Development to give a presentation for SOAR. Horton began by mentioning how important Flour-BWXT is to them, “What Flour does is for all four counties in the region. You are going to see that vision of what this airport can be with the schools(SCCTC) help, can be powerful.” He continued speaking about how that if all the groups continued to work together that people will see this vision come into fruition. 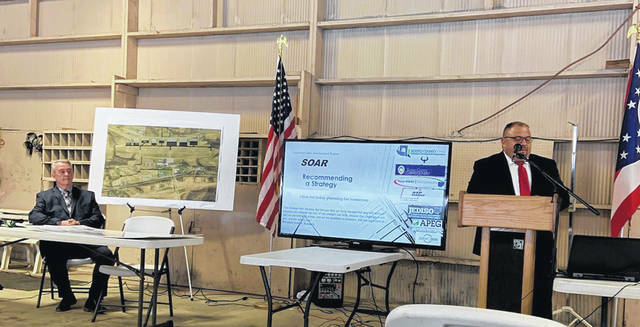 Davis ended the meeting with thoughts, “We’re going to do our part to bring this to fruition to bring prosperity to our area again.” Project SOAR seemed to give those in attendance a vision and hope for the future of Southern Ohio especially Scioto County. 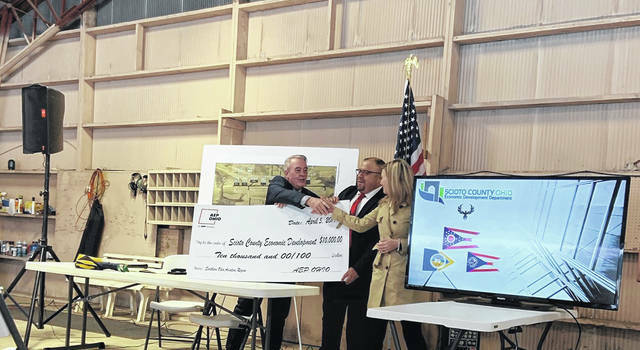 https://www.portsmouth-dailytimes.com/wp-content/uploads/sites/28/2019/04/web1_check.jpgLiberty Shindel on right presenting the check to Scioto County Economic Development representatives. https://www.portsmouth-dailytimes.com/wp-content/uploads/sites/28/2019/04/web1_flour-a-plant.jpgJD Dowell, representing Flour-BWXT speaking to the crowd about SOAR. https://www.portsmouth-dailytimes.com/wp-content/uploads/sites/28/2019/04/web1_Josh-Shoemaker.jpgJosh Shoemaker, Central Office Administrator speaking for the Scioto County Career and Technical Center (SCCTC). 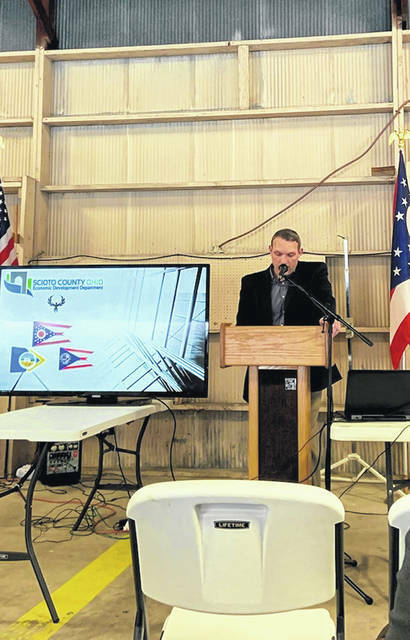 https://www.portsmouth-dailytimes.com/wp-content/uploads/sites/28/2019/04/web1_scioto-County-econ.jpgLeft to right: Robert Horton Director of Scioto County Economic Development with a map and mission statement for SOAR and Mark Ward, Assistant Director speaking to the crowd.